After 1945, politicians and members of the resistance returned from overseas, while groups of pro-fascist intellectuals and politicians emigrated. Germans were resettled, Magyars were discriminated against up to 1948, and thousands of citizens of Slovakia were deported to the Soviet Union. Post-war Czechoslovakia found itself in the Soviet sphere of influence. Its political system is usually referred to as a ‘limited democracy’, in which few political parties, nationwide or Slovak social organisations and the National Front were allowed to operate. However this lasted for a short period of time. The communists in the Czech lands and the Democratic Party in Slovakia won the parliamentary elections in 1946. In the summer of 1947 the government, under the pressure of Moscow, rejected economic assistance in the form of the Marshall Plan. 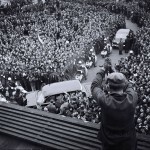 Shortly afterwards, the communists took advantage of radical post-war moods; they acquired significant offices and rallied masses of unsatisfied people to the streets, and in February 1948 they implemented a coup d’etat which gave them power that they would not relinquish for the next 40 years. The new totalitarian regime with its Communist Party control, many incapable officials and materialistic ideology controlled practically everything. It liquidated civil rights, independent institutions and thinking, elections became only a formality, and in the name of the ideal society, traditions were demolished and inhuman forms of expression unleashed. Stalinist centralism practically liquidated all elements of the autonomous status of Slovakia. It cruelly persecuted not only its political opponents but also farmers, officials, intellectuals, church officials and communists themselves. Trumped up trials and personal purges whipped up an atmosphere of fear. Czechoslovakia became absolutely dependant on the Soviet Union; it mechanically took over all aspects of its life which was, frequently tragically. Practically all production capacities were nationalised and farmers were forced to enter the agricultural co-operatives. Large enterprises, especially in heavy industry, were eagerly built, although they were inappropriate for the conditions of small Slovakia. Towns grew rapidly, at the cost of tasteless prefabricated buildings and the liquidation of historical centres. The healthcare, educational and cultural infrastructure were completed (including for example the Slovak National Gallery, the Slovak Philharmonic, the art school system and a number of museums). For the first time these areas were also accessible to the lower social layers. National minorities received fair national rights. In the 1960s the Communist dictatorship ‘softened’. Stalin’s violence was criticised and methods were sought to harmonise socialism with democracy and freedom. The democratisation process, embodied particularly in the highest political official Alexander Dubcek, peaked in 1968. Censorship was lifted, small private businesses were permitted, new organisations sprung up spontaneously and the market was expected to play a certain role in the centrally-managed economy. 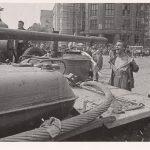 However, in August 1968, before the features of ‘socialism with a human face’ could be displayed, the armies of the Warsaw Pact occupied Czechoslovakia. The Soviet army was to remain until 1991. In the 1960s, the push for a dignified state legal status of Slovakia was equally strong. In October 1968, Czechoslovakia was officially changed into the federative state of two national republics – Slovak and Czech. However, due to the normalisation regime headed by Gustav Husák, this federation existed only symbolically. Although Husák’s regime was substantially more moderate than the Stalinism of the 1950s, it renewed strong centralism, demanded unity and obedience and discriminated against and persecuted tens of thousands of people. Approximately 200,000 Czechs and Slovaks emigrated. Although Slovakia recorded economic and social growth during this period, the competitiveness of the Czechoslovak economy slowed, and it lagged behind that of the developed world. Moreover, Czechoslovakia’s international isolation was significant. The environment in the country was deteriorating, offices were ineffective, services did not meet needs, and corruption and ‘cronyism’ became part of everyday life. Social communication was reduced to empty phrases. In this ‘grey’ atmosphere, groups of dissidents, ecologists, church activists and artists criticised the freedom-less situation and rallied for civil rights. Dissatisfaction with unfree and unfair conditions in the country and a sense of lack, however, spread across all social layers. The protest events took place in public, especially in Prague. In Slovakia, the ‘candle manifestation’ of March 1988 in Bratislava was the largest public protest for religious and civil freedom. The ‘more enlightened’ Communists and state officials were aware of the necessity of reforms, especially after Mikhail Gorbachov came to power in the Soviet Union. In November 1989, under the influence of mass protests throughout Czechoslovakia, the ineffective and tired Communist regime fell. The deadened society began to spring into life.